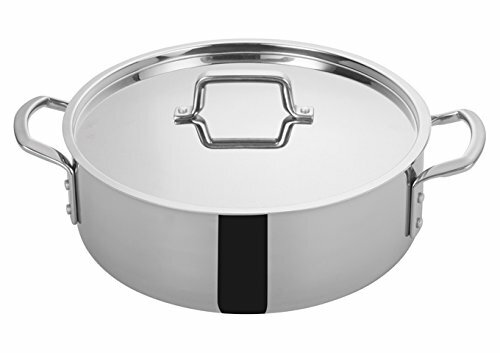 Winco TGBZ-12, 12 Quart Tri-GenTM Tri-Ply Stainless Steel Brazier, with Mirror Finish Exterior and Satin Finish Interior, Commercial Grade Braiser Pan is must-have item for any home or commercial kitchen. Manufactured from rust-resistant 18/8 stainless steel, the braiser comes with convenient cover. Securely riveted wide loop handles provide excellent stability, especially for larger hands when handling with hot pads. You can use it for sautéing, browning, deep-frying and more! The practical brazier pan is a must for any restaurant's kitchen and other establishment with high food preparation volume. Perfect for preparing many types of foods while offering beautiful style and balance, this commercial grade sauce pan can be used with any type of cooktop, including induction. Features beautiful mirror finish exterior and satin finish interior. Easy to clean. Made from rust-resistant 18/8 stainless steel. Measures 13.5-Inch diameter. Can be used with any type of cooktop, including induction. Provides excellent heat conduction and is strong enough to withstand high temperatures without warping.